Almost a year ago, Mercedes-Benz introduced an app for the iPhone and Blackberry called mbrace. The application allowed for drivers to do everything from locking and unlocking doors to contacting roadside assistance and locating your vehicle in a parking lot. Mercedes-Benz has updated the app with a few more useful features. The new mbrace 2.0 adds a new Concierge feature which allows customers to seamlessly access Mercedes-Benz Concierge services while away from the vehicle. Concierge can access the caller’s location and deliver relevant entertainment recommendations, restaurant locations, directions, traffic updates and more. All listing information can be sent directly from the concierge to an in-vehicle navigation system. If you own more than one Mercedes, the new update has got you covered with a new feature that allows user to save multiple accounts in the login screen and assign nicknames, making it simple and quick to access multiple mbrace accounts from one device. 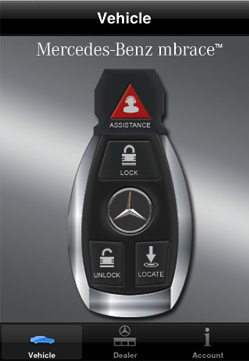 In addition to the new features, Roadside Assistance has been enhanced so that the customer’s location information is transmitted to the Mercedes-Benz Roadside Assistance Center.